New signing Yves Bissouma made his first appearance for Albion in a behind-closed-doors friendly with Portsmouth today. The 21-year-old joined the Seagulls from Lille on a five-year deal for an undisclosed fee last week and partnered Beram Kayal in central midfield in the 1-1 draw. The game was split into three 25-minute periods and Shane Duffy allayed any injury fears by playing the full 75 minutes. The defender had gone off early on the 2-1 defeat at AFC Wimbledon on Saturday. Goalkeeper Mathew Ryan made his first appearance of pre-season for Albion, after returning to training last week following his World Cup exploits with Australia. Pompey went ahead early in the third period when Brett Pitman poked the ball home after Christian Burgess headed Adam May's corner goalwards. 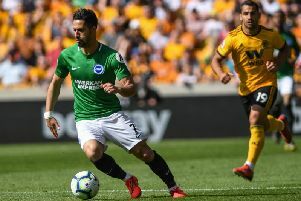 Albion went close to equalising shortly afterwards but Ezequiel Schelotto's shot came back off a post and Beram Kayal then glanced a header wide. Brighton levelled in the 65th minute when Tomer Hemed crossed from the right and Anthony Knockaert was unmarked to head home from close range. Albion pressed for a winner late on and Hemed hooked an effort wide, before Knockaert had a low shot saved.